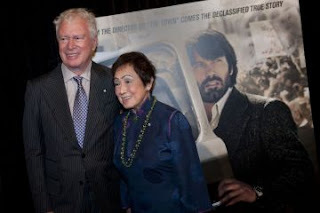 Last night, I saw Argo. It was great. Really, honestly, tensely great. Ben Affleck has once again proved that he is a far more interesting director than he is an actor (though, he is a good actor when he’s directing himself it seems). Bryan Cranston, Clea Duvall, Victor Garber, John Goodman and Alan Arkin were all spectacular, and the newcomers whose names I didn’t (and still don’t) know were pretty great too. 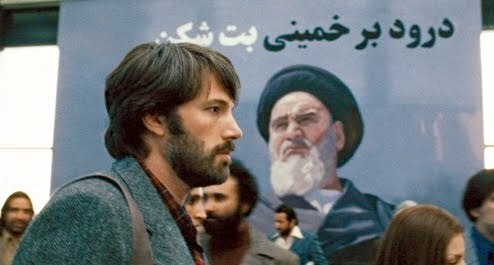 In case you haven’t been able to piece it together from the trailers (and in that case, I totally don’t blame you), Argo is based on a true story about the Iran Hostage Crisis. In my mental picture of historical films, this is the film that hits right between The President’s Men and Charlie Wilson’s War. Also, happens at the same time as Miracle. Had to get that in there. They installed Ayatollah Khomeini as the ruler, and set about changing the country. The Shah fled to America. Naturally, this upset the Iranians, who were none too pleased at being denied the chance for justice (though, at this point, justice far more likely meant death). In rage at the United States for its actions in support of the Shah, a group of radical students and militants stormed the US embassy in Tehran, taking 52 hostages and holding them for 444 days. Eight American servicemen and one Iranian civilian died. That’s the Iran Hostage Crisis. It was a chilling chapter of history that only solidified the darkness that seemed to be creeping over the world, caused President Carter’s defeat in the 1980 presidential election, and has shaped US relations with Iran, and our entire foreign policy, for the past thirty years. This is a movie that takes place during that time. So, no, it’s not a very happy movie. 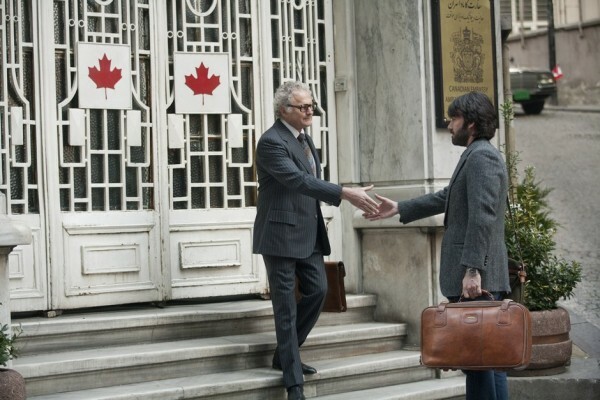 The film follows six of the embassy workers who actually escaped and were forced to hide in the Canadian Ambassador’s house for 79 days. It takes you into their claustrophobic, strained life, and then shows you how they got out. Which is the ridiculous part. I won’t spoil the whole thing, but if you’ve seen the trailers, then you know what I’m talking about. Ben Affleck plays Tony Mendez, a real guy, whose specialty was to get people out of hostile countries. And in this case, the best way to get those people out of Tehran was to pretend that they were Canadian’s making a sci-fi movie and scouting locations. Which is ridiculous. But it really did happen. And that’s where the story gets, well, interesting. The Canadian Caper, as it’s best known, didn’t become declassified until 1997. So, for twenty-five years, we only knew part of the story. It was a cool part, admittedly, but only part. And the story we knew gave most of the credit (all of it, actually) to the Canadians. 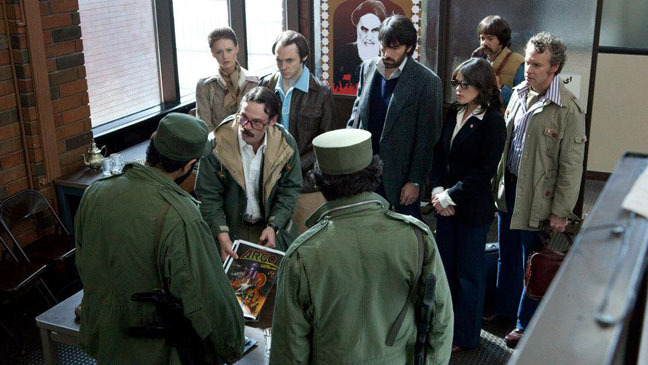 There’s an issue that we run into in movies that are “based on a true story”, especially ones that are focused on a particularly sore historical spot like the Iran Hostage Crisis. We want to watch the movie and uncomplicatedly root for our guys, right? We want to see the film and think, these are the bad guys, these are the good guys, I can tell who is supposed to win. Life is nothing like that. Yes, the Iran Hostage Crisis was horrible, cruel, and devastating to the American consciousness, to say nothing of what it did to the hostages. But when we simplify the story down to “us good them bad”, we lose the real story. We lose the complexity to say that while the militants were inarguably wrong in their actions, they were also justifiably angry. They had been tortured and starved for almost thirty years by a man that we put in office. They had a right to be pissed. Does that ever excuse something like what happened? No, of course not. But it can explain it. 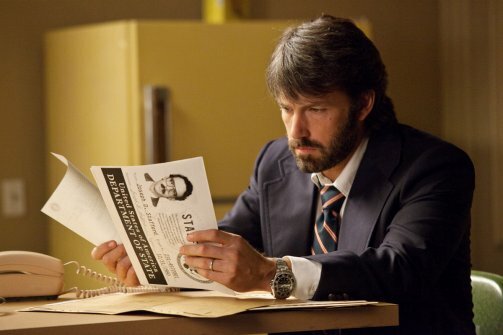 And while I, just like everyone else, enjoys a nice solid cheer for the good guys (see here my love of the film Miracle), I think that Argo might have put too fine a point on it. I think that in telling the “true” story, we actually lost something. For twenty-five years, we were under the impression that those six Americans were saved because of the efforts of Canadian diplomacy and bravery. The film, though it doesn’t contradict that, puts far more credit on CIA and their operations. I’m not saying it’s wrong, precisely, just that it’s not the full picture. For starters, Tony Mendez actually worked incredibly intensively with Ottowa to put the plan in place. It wasn’t a CIA op that happened to involve Canadian cover identities, it was an in depth collaboration that lasted months. The real Ken and Pat Taylor. Furthermore, Canadian Ambassador Ken Taylor (Victor Garber’s character) was arguably the most influential man in the entire story. 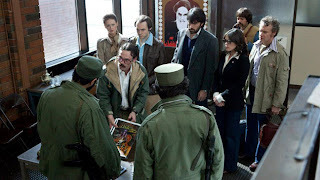 While Mendez labored in North America to put the story together, Taylor had to conceal six people moving in and out of Canadian safehouses in Tehran, all while maintaining diplomatic relations with a government that wasn’t too discerning about the difference between Canada and the US. The man was amazing. Let’s remember that Taylor had no actual duty to those people. He could have turned them away like most of the other embassies had, and no one would have looked down on him. They weren’t his, and he was in a precarious position to begin with. But he didn’t do that. He took them in and kept them safe for 79 days. Not only that, but he also managed to subtly get his staff out of the country safely, close the embassy, and flee the country before diplomatic relations between Canada and Iran soured. It’s a lot. Now, again, I’m not saying that there’s anything wrong with following Mendez’ journey on film, or that what he and the six hostages did wasn’t spectacular and insane. Because it totally was. What I’m saying is simply that, in focusing on the fantastical elements of the story (Fake movie! Hollywood! Cover identities! ), we can lose sight of the other heroes. The ones who did it all quietly and in constant danger, but didn’t ask for recognition. Look, history is not an exact science. Everyone has a different point of view. This was an American movie, so of course it told an American story. That happens. But we have a duty in film, television, and any cultural medium, to tell not just the flashiest, most exciting story, but to tell the most important ones as well. And those aren’t always the same thing. So, here’s to you, Canada. You jumped on a grenade to save us, ruining your diplomatic relations with a volatile country in order to keep just a few of us safe. If you could see me now, I’m clapping in your general direction.